I really, really, really love this. I had hoped it would happen, so when it was announced this weekend, I was pumped. The official release from the Chargers. Running back LaDainian Tomlinson, the NFL’s fifth all-time leading rusher and the San Diego Chargers’ first-round pick in the 2001 NFL Draft, will re-sign with San Diego and immediately announce his retirement from the National Football League at a press conference Monday at Chargers Park. The announcement will be streamed live on Chargers.com on Monday, June 18 at 11 a.m. (PT) Tomlinson and Chargers President Dean Spanos will speak. Hmmmm… and where will AJ Smith be sitting? I’ve always loved LT…even when he was a Jet. I had the pleasure of spending some time with him at a couple charity events, and he is just a really nice dude. And despite the feelings you might’ve had when he left the Bolts, he was this franchise for a friggin’ decade. 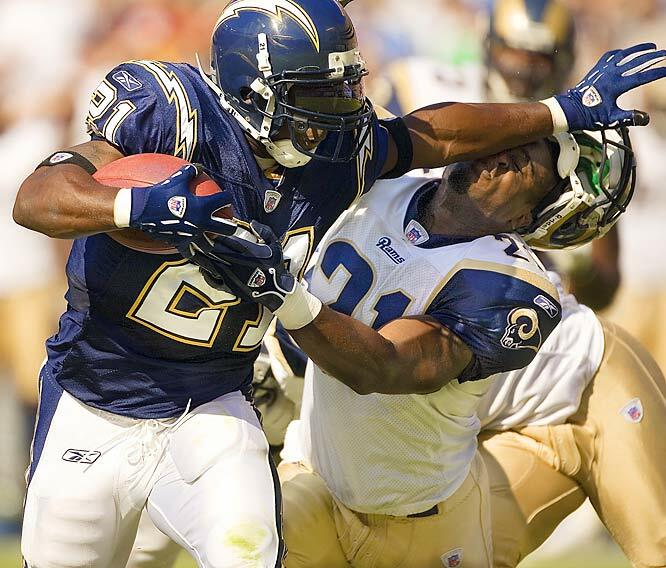 This is my favorite photo of LT.
1) I want the Bolts to retire LT’s number 21, the last Charger to ever wear it. 2) I want Tebow to be sitting up there with them, next to his family. Wait, what? Well, I know Tebow was in town for Father’s Day yesterday and I think it would be hysterical because it would make no sense whatsoever and it would piss everybody in San Diego off and I think that’s funny. That’s all for now. This entry was posted in Football, NFL and tagged Chargers retiring number 21, LaDainian Tomlinson, LaDainian Tomlinson retiring, LT, LT Chargers, LT press conference, LT retiring. Bookmark the permalink.